Years before she died of breast cancer in 2007, artist and philanthropist Linda Pace knew she wanted to build an exhibition space for her world-class contemporary art collection that would be free and open to the public. She just didn’t know what it would look like. 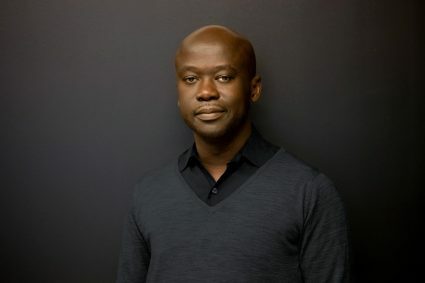 Pace was introduced to noted architect Sir David Adjaye by a mutual friend, London-based filmmaker and installation artist Isaac Julien, and the two agreed to collaborate on the project. She only met Adjaye in person three times—once in 2006 in London, and twice in 2007, when Adjaye made two site visits to San Antonio. 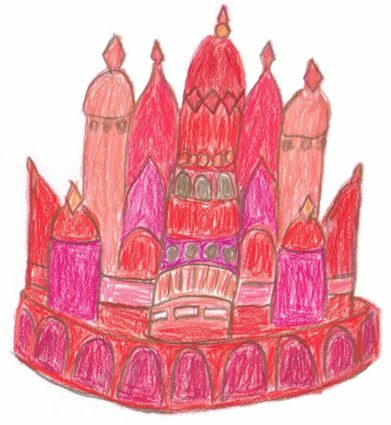 Before Adjaye’s first San Antonio visit, Pace dreamt of the art center and she shared with him her vision of a red-hued, Kremlin-esque structure. The sketch was one in a series of dream drawings she had produced. Pace’s sketch was meant as a starting point, and not to be interpreted literally, O’Connor said. More than 10 years later, the two-story crimson Ruby City is nearly complete at 150 Camp St. just off South Flores Street near the South Alamo intersection. As O’Connor sees it, it’s Pace’s final artwork realized by Adjaye, who’s based out of London and New York. In a lecture scheduled for Tuesday night at Laurie Auditorium, Adjaye will talk about his brief collaboration with Pace, about how her vision and collection helped shape his design for Ruby City, which Architectural Digest named one of the 14 Most Anticipated Buildings of 2019. He’ll also dive deeper into the architecture. The talk is scheduled for 6-7:30 p.m. and is free and open to the public. Much attention has been given to Adjaye’s other works, including the National Museum of African American History and Culture on the National Mall in Washington, D.C., and the Museum of Contemporary Art Denver. The lecture Tuesday night is Adjaye’s chance to shed more light on the Ruby City story, O’Connor said. “He wants to take this opportunity to disseminate this information that really hasn’t been made available to the public,” she said. The $15.6 million art center is scheduled to open to the public in October. Between now and then, more interior work has to be done inside the 14,472-square-foot space, including the build out for a three-channel Julien film installation. The interior’s HVAC and humidity control systems also need time to adapt to South Texas conditions. “It takes a little while for that system to get tightened up,” O’Connor said. The space will house Pace’s collection, including works by local artists such as Cruz Ortiz and Ana Fernandez, in three second-floor gallery spaces. During his visits to San Antonio, Adjaye drew inspiration from the Spanish colonial missions, specifically the way natural light enters the old churches through windows, a design element he incorporated into Ruby City. The museum’s exterior is composed of 16-foot-tall cast concrete panels fabricated in Mexico City that have crushed red glass baked into them. 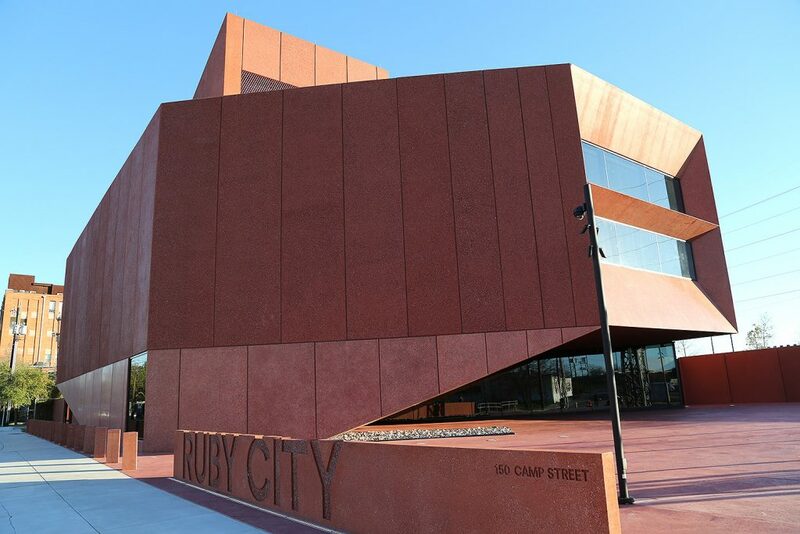 Ruby City is one component of an overall campus, which includes Chris Park, named after Pace’s son Chris who died at age 24, and the exhibition space Studio inside the park—all on Camp Street. And the end of February, Julien’s 1989 film “Looking for Langston” will be screened at Studio. After his lecture, Adjaye, along with Julien, will return to San Antonio in October for more programming centered around Ruby City’s opening.